Collecting folk hero Steve Denny regales the 'Chive Cast with tales of finding literally thousands of cared figures and prototypes in the wild wild Midwest of 1980s and 1990s Cincinnati. Learn about the proof finds, Canadian Droids and Ewoks, UDEs, Rocket Fetts, Revenge proof sets for $50 and the mysterious Mr. X. Plus, Skye unveils a conspiracy theory that may lead to the greatest scandal in the history of the hobby. All this on the cursed 83rd Vintage Pod! Brought to you with the help of John Wooten and KennerCollector.com. 48:30 – Story Time: Zteca Influence on Kenner and Banana Boxes? 1:20:29 – How Many Rocket Fetts? The modern rocket was invented by the Nazis to kill British people. But then there was Laika the Soviet space dog, the Apollo program, and Elton John, and by the '70s the rocket had been rehabilitated, allowing it to become a staple of the toy and craft industries, played with by thousands of children. And all of this while we were under constant threat of annihilation by ICBMs. In America the model rocket business was dominated by Estes, the brainchild of Colorado native Vern Estes, whose innovative and economical engines revolutionized the industry in the 1950s. 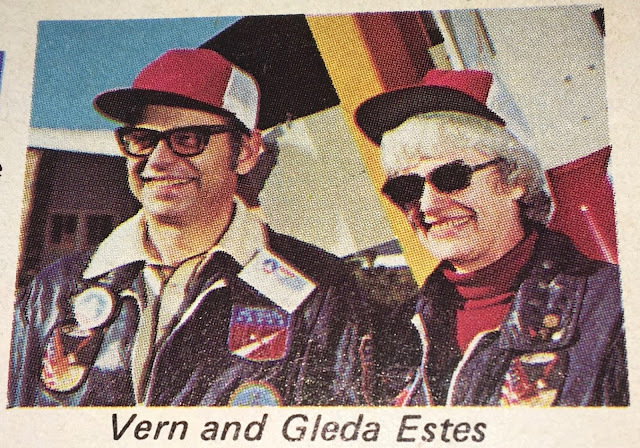 Even though Estes was sold to Damon in the '70s, the company remained associated with Vern, who personally addressed customers in regularly issued catalogs and newsletters. By the '70s Estes had branched out into licensing, releasing rockets associated with properties such as Star Trek. So when Star Wars hit theaters, you can imagine Vern's excitement. Here was an opportunity to sell rockets in conjunction with the biggest space movie of all time! Reportedly, his trucker cap spun around three times, and two of the patches popped off of his bomber jacket. 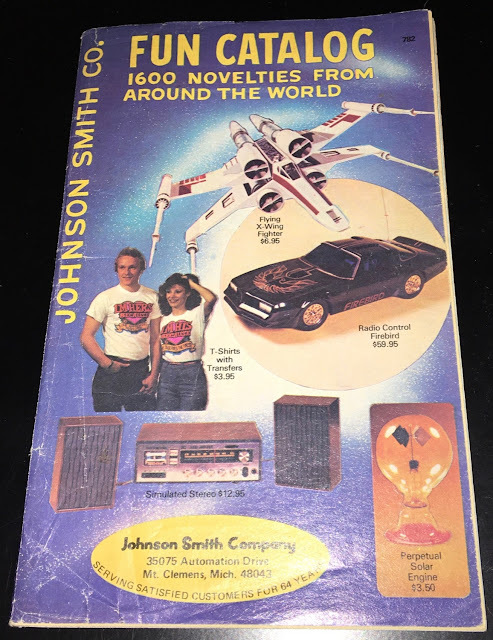 Here's Vern's justifiably proud announcement of his company's acquisition of the license, printed on page one of the 1978 catalog, the cover of which you see at the top of this post. Of course, if you saw this as a kid, your eyes were drawn to the art rather than the text. At which point you wondered: Why is Luke doing jazzercise? 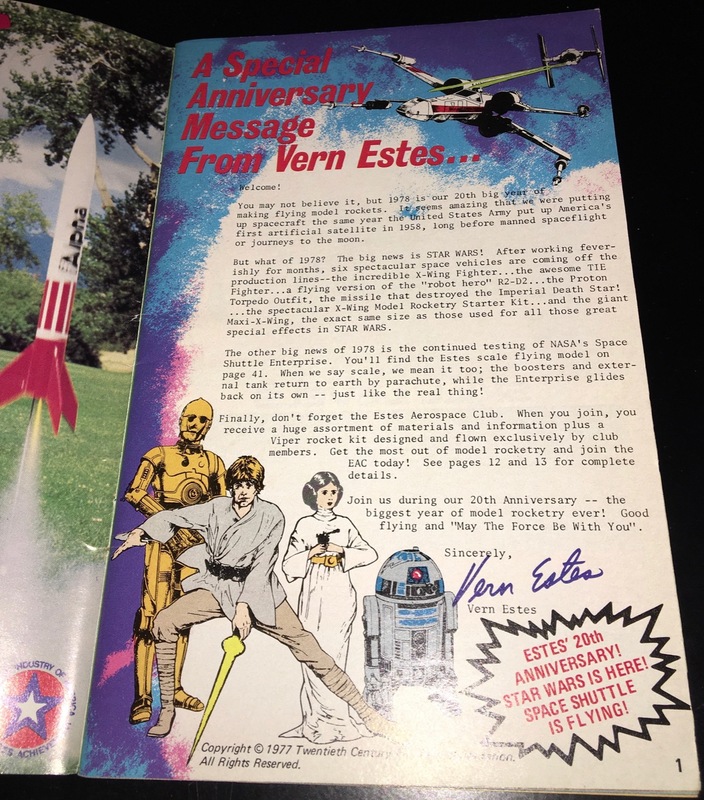 As Vern mentions, Estes' 1978 Star Wars line consisted of six different products. 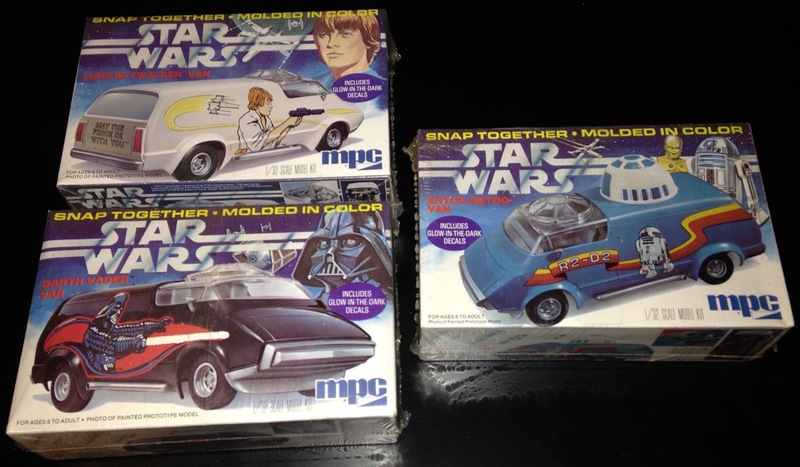 Judging by the information in the catalog, most of these were released in the spring, meaning they coincided with the debut in stores of Kenner's first Star Wars action figures. But one rocket was released slightly earlier: the Proton Torpedo. I can almost hear you muttering: "Well, that's just a missile with a decal that says 'Star Wars' on it. And it's pink." True. But the box art was pretty rad. And the fact that it didn't require a specialized design meant that Estes could release it quickly by modifying one of their existing products. As to the color...well, the proton torpedoes used in the movie were pink. Don't you value authenticity? The Proton Torpedo was pricier than many of Estes' other products due to the fact that it came packaged with most of what was required to launch the rocket. The bulk of the company's other rockets required engines and launching paraphernalia that were available as separate purchases. 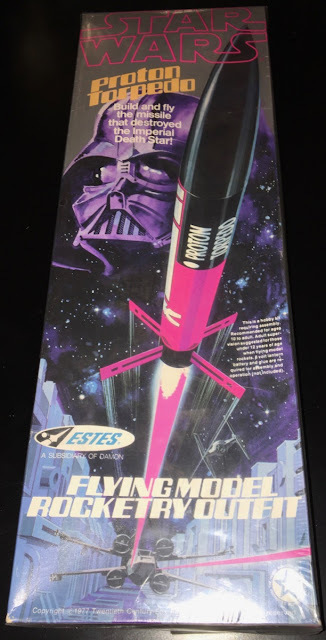 I think it's likely that Estes, knowing that a lot of kids would be introduced to model rocketry via this kit, wanted to ensure that none were disappointed by an unanticipated requirement to purchase additional accessories. By the way, have you ever wondered why George Lucas called the missiles utilized by the X-Wing Fighter proton torpedoes? Star Trek, of course, had photon torpedoes. This seems like a decision likely to inspire confusion. It's claimed that Gene Rodenberry, upon seeing the Death Star briefing scene for the first time, rolled his eyes and said, "Well, at least the main character is named Luke Skywalker and not Captain Dirk." If the Proton Torpedo suffered from being too obviously a rocket, Estes' R2-D2 struggled with the opposite problem: it didn't look the least bit like a projectile. Anticipating this problem, Estes printed a call-out on the front of box assuring their customers that, yes, "it really flies!" Little did the folks at Estes know that, come 2002 and the release of Attack of the Clones, R2-D2 would be shown to possess full flight capability. Too bad he didn't use it to escape from that awful movie. Of course, neither the engineers at Estes nor the animators of Clones have anything on the legendary Otto Dieffenbach, the Wernher von Braun of droid ballistics. Estes' marketing materials emphasized that the droid was a "robot hero," lest it be forgotten that R2-D2 wasn't evil. You can tell these kids love R2-D2 because they've fashioned their hair after him. 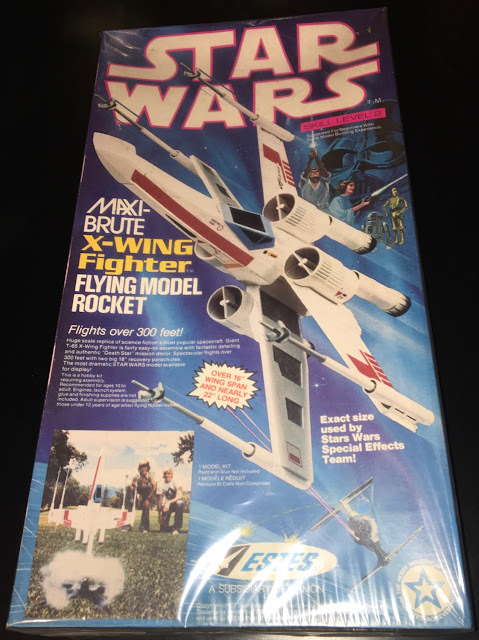 Released around the same time as R2-D2 was this X-Wing Fighter rocket. It was designed to soar over 300 feet into the air. Given the prominent role played by the X-Wings in Star Wars, and the fact that, unlike R2-D2, they were explicitly intended for flight, the X-Wing Fighter is rightly reckoned the flagship of the Estes line. The marketability of the product was such that it was featured on the cover of this novelty catalog, where it was only slightly overshadowed by the technological breakthrough represented by the Perpetual Solar Engine. Cost of a radio-controlled Firebird in 2017 dollars: $225. The X-Wing isn't the sole Star Wars-related item included in the catalog: Death Invader makes an appearance on page 79. He's featured beside other luminaries of the day, such as Santa Claus and Drunk. 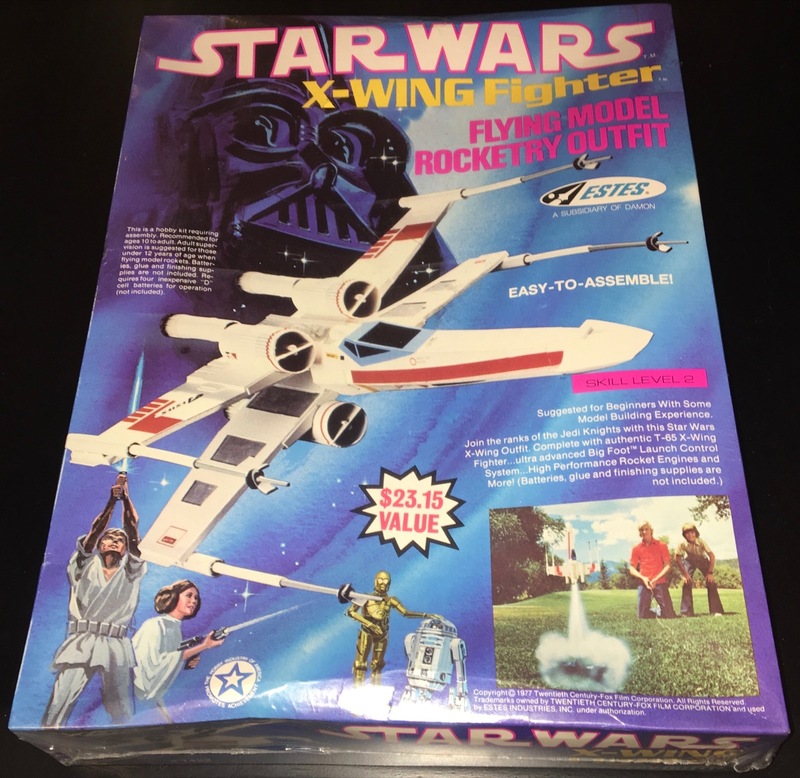 As the text inside the catalog makes clear, one had to purchase a host of materials in order to make the X-Wing Fighter rocket function as intended. So, as they did in the case of the Proton Torpedo, Estes marketed a version of the X-Wing that came with most of the materials needed to make the thing soar into the sky. It was called, somewhat too wordily, The X-Wing Fighter Flying Model Rocketry Outfit. I have no idea what recovery wadding is, but I like saying "recovery wadding." From a collecting standpoint the product is somewhat nicer than the bare-bones version of the X-Wing, as the front of its box features cool art of Darth Vader and the droids in addition to the vignette of Luke and Leia. But my favorite aspect of the box is this graphic, printed (or intentionally hidden?) on its side. 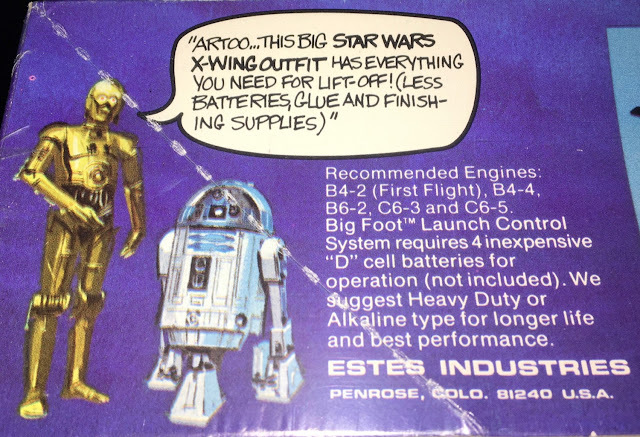 It depicts C-3PO telling R2-D2 that the package includes everything you need, provided your definition of "everything" doesn't include batteries, glue, and finishing supplies. R2-D2 is a hard droid to read, but I'm pretty sure I can see the disappointment that has overtaken him upon taking in this brazen confession of corporate perfidy. 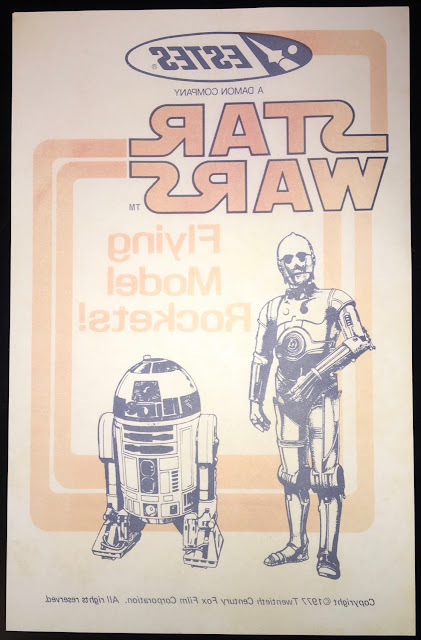 Is this the jerkiest C-3PO to appear on a vintage product? I think it might be. Nerdlingers: I hereby challenge you to find a jerkier C-3PO. But the X-Wing Outfit wasn't the end of Estes' involvement with the X-Wing Fighter: The company also released a larger version of the spacecraft. It was called the Maxi-Brute X-Wing Fighter. I have no idea what "Maxi-Brute" is supposed to mean or why Estes would use an appellation that calls to mind a feminine hygiene product infused with cologne. But I'm quite positive that the product's big selling point was that it was the same size as the effects models used by ILM during the filming of Star Wars. 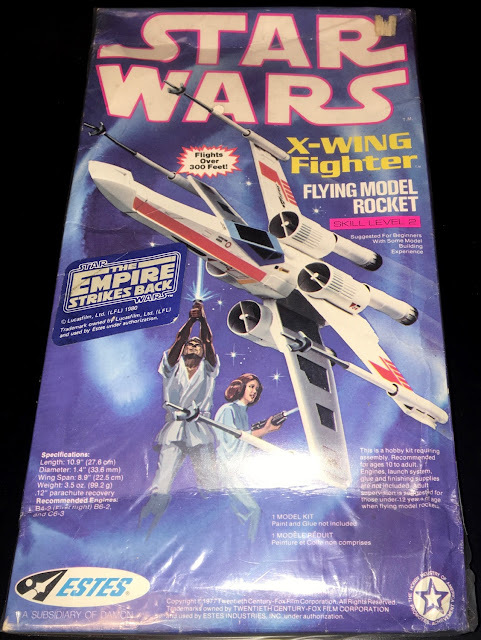 The similar graphics and coloring of the boxes in which the three X-Wing products came packaged makes them hard to differentiate. Here's a group shot of the trio. 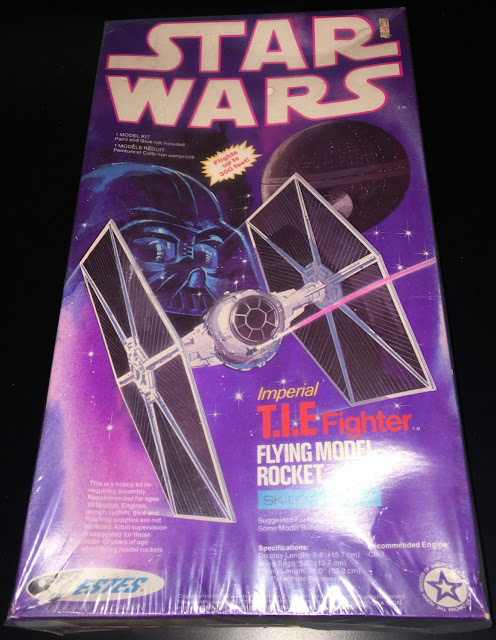 The final product released by Estes as part of their vintage Star Wars line is today the hardest to find in a boxed state: The Imperial TIE Fighter. I've seen only a handful of examples. It's sometimes claimed that ILM used some of Estes' TIE Fighters in effects shots created for The Empire Strikes Back and Return of the Jedi. I have no idea how true that is. Something similar is said of MPC's model kits. 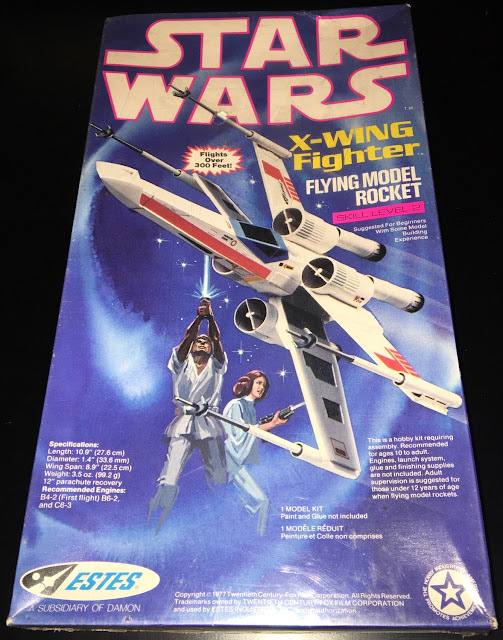 You had to look at the side of the box to discover that, in order to make the boxy TIE Fighter fly, it was necessary to affix a long, missile-shaped appendage to it. For some reason Jerky C-3PO didn't deliver this particular bit of bad news; it had to be inferred by the overly aggressive manner in which the kid on the right is attempting to talk his younger brother into enjoying this clearly sucky experience. Estes was still selling Star Wars rockets in 1980 when The Empire Strikes Back hit theaters. The company's spring 1980 newsletter even included this cool preview of the film's vehicles and characters. However, no additional rockets were released during the vintage years -- not even one representing Boba Fett, as likely a candidate for rocketry glory as any character in the Star Wars universe. 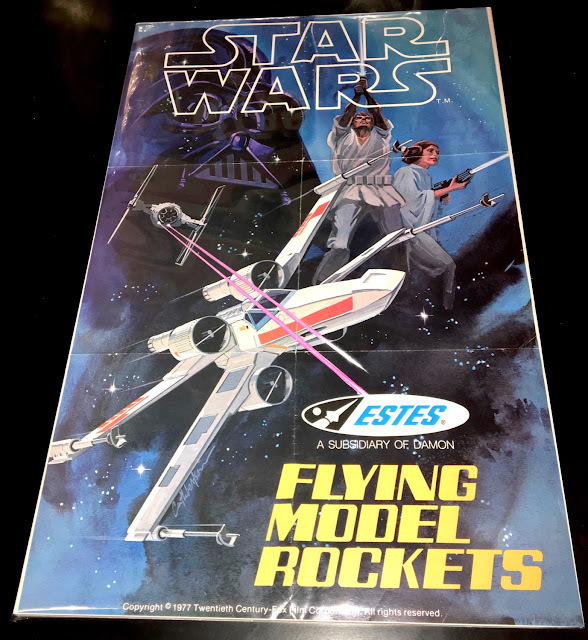 As this example of the X-Wing rocket proves, Estes, like MPC, updated their existing packaging with ESB stickers when the release of the sequel was imminent. These stickered versions must be pretty rare; this is the only example I've seen. Estes also issued several of their rockets in bags decorated with graphical header cards. But the boxed rockets are the Estes products that collectors tend to lust after. Not only do they feature great artwork, they're scarce. It takes quite a bit of effort to assemble the complete set. 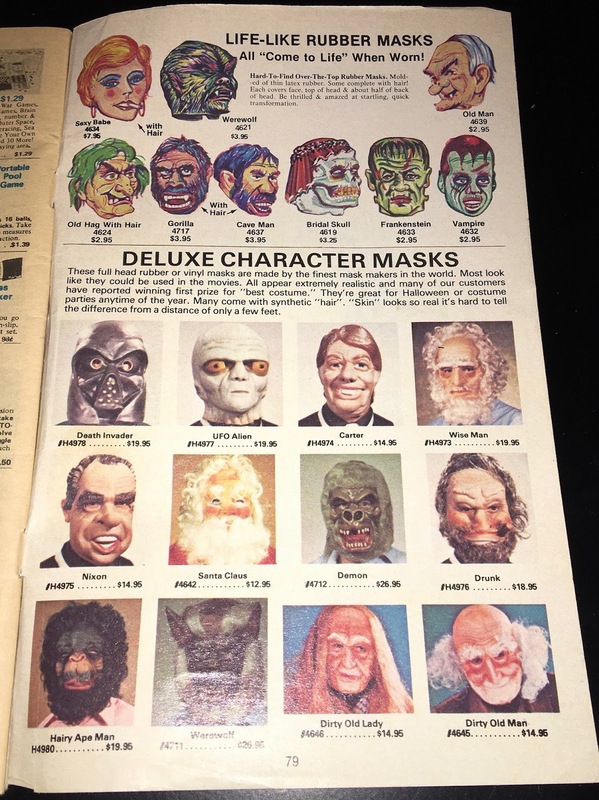 The collector who wants to get really serious about collecting this stuff might try pursuing the posters Estes issued as store displays. I am aware of two styles: the one you see above and the one seen here. According to Pete Vilmur's write-up in the linked database entry, the Proton Torpedo poster was also used as a premium. I wouldn't be surprised if the same is true of the X-Wing poster. Estes also produced a couple of Star Wars-themed iron-ons: one representing the droids and another showing a dogfight between a TIE and an X-Wing. Kids received these as freebies when they ordered rockets during odd-numbered months. The iron-ons weren't particularly colorful, but they were free, and -- uh -- super-neat. Once you've delved into the realm of super-neat iron-ons, you've exhausted your topic. 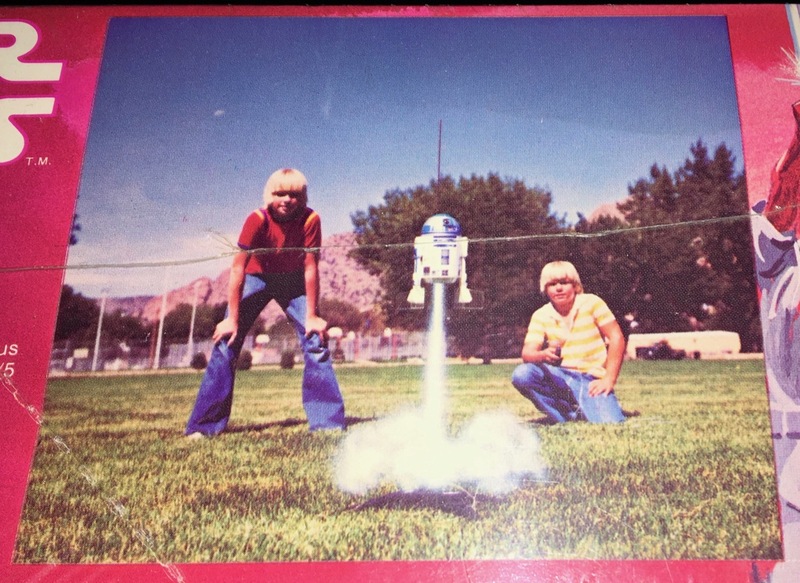 So here ends our look at the wonderful world of vintage Estes model rockets. If you decide to collect these rockets, good luck. And in the immortal words of perhaps our greatest Jedi: "May the Force be with you!" Skye and Steve talk about the amazing and underappreciated world of MPC Model Kits. 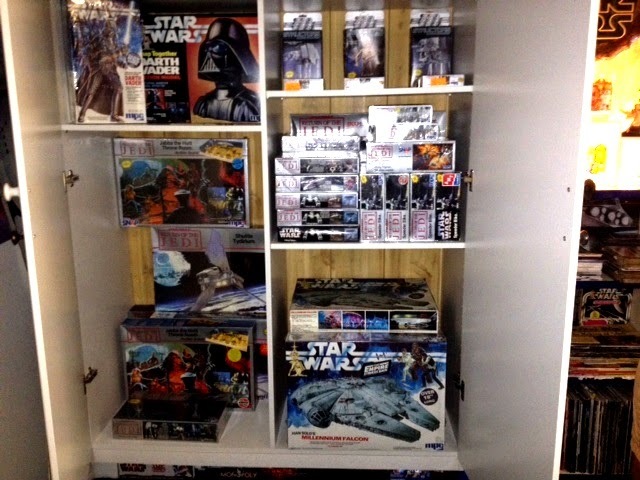 They are joined by innovative artist Mark Enright and super collector Ron Salvatore who talk about their two amazing SWCA Blog entries on Star Wars and Empire Strikes Back model sets. Do you know how many model kits were made? Do you know about the art? Do you know how inexpensive they are to collect? Do you know what the rare ones are? Do you know what you are missing? No, you don't! So have a listen to the third Blog Log Pod.